Every day, corporations produce and preserve a massive quantity of audio data. From customer interaction recordings to stored voicemails, audio content is generated and archived every moment of every day. This presents a significant review challenge for lawyers in an eDisclosure cycle. Not only must reviewers contend with immense volumes of data, the content itself can be challenging. Dead spaces, unclear speech, diffused conversations, languages and accents—all can increase the complexity, time and cost of the review. Full integration of Nexidia’s phonetic search technology to prioritise documents for review and to ensure quality of workflow; download the Integrated Phonetic Search datasheet to learn more. 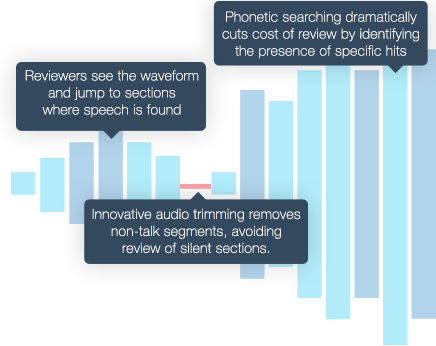 Consilio simplifies the complexity inherent in audio discovery. And we do it around the globe. 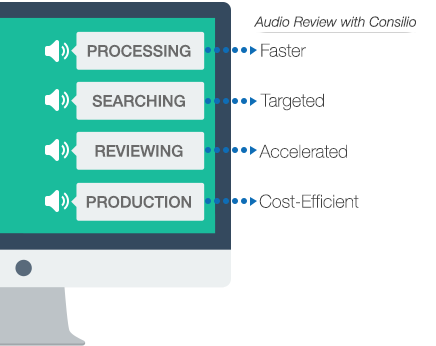 Our Enhanced Audio Review solution is fully deployed into our enterprise-class data centres, located in key global markets. 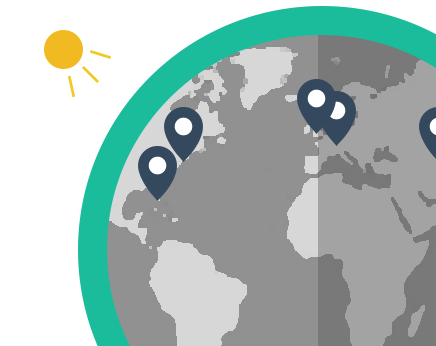 This means we are ready to respond today to your audio eDisclosure needs—no matter what your language or location. For more information, download our Enhanced Audio Review datasheet.